Families are being created in more ways than ever—including cutting-edge medical technology as well as domestic and international adoption. How do you determine your path to parenthood? 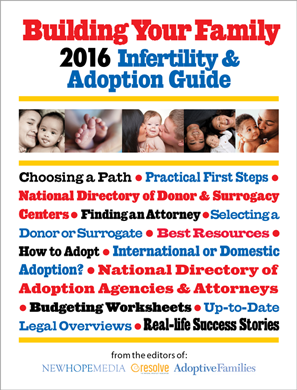 In our annual Building Your Family – Infertility & Adoption Guide we demystify your alternatives, point out key considerations, and help you plan your next steps. Along with clear, practical overviews of the cost, timing, guidelines, and legal and medical processes involved in becoming a parent through adoption, donor conception, or surrogacy you’ll find inspiring first-person stories. When you’ve chosen your route and are ready to get started, search our directories of adoption agencies, adoption and ART attorneys, and ART clinics to help you find the right team of professionals to make your dream of family a reality.